It's cold and flu season and for the past week my household has had the sniffles. It all started when Madison came home from Kindergarten with a cough, and that's how it usually starts. One child would come home with an illness and for some reason, we all just manage to succumb to whatever illness is going around. 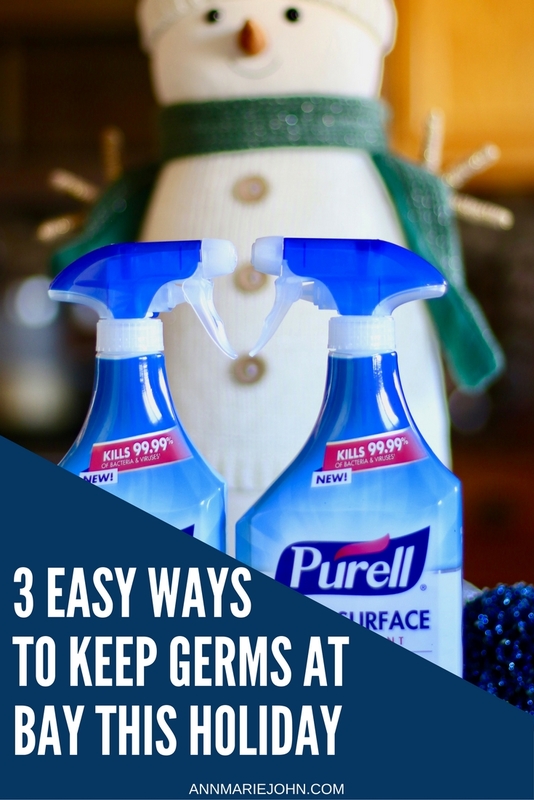 However, today I want to share 3 easy ways you can keep germs at bay with the help of PURELL® Multi Surface Disinfectant. For years I have trusted PURELL® Hand Sanitizer for not just myself but my entire family. I would send it to school in my children's backpacks, keep it in my handbag and even in my car. You never know when you're going to need to clean your hands, and there's no water available. However, when you have children, especially with the cold and flu season upon us, you want to keep germs at bay. There's nothing worse than spending hours in the ER, when you could have prevented it in the first place. I love disinfecting surfaces and have used other products in the past, but have always had a problem with the "hospital" smell, and the fact that it wasn't safe around food and my pets. When I learned about PURELL® Multi Surface Disinfectant I knew that this was something I wanted in my home. It's brand new and like nothing else on the market today. I was able to purchase mine on Amazon and being a prime member received it in 2 days. I couldn't wait to start disinfecting and the smell, oh my goodness, the smell! I could finally disinfect and clean without having to put a mask on. Yes this PURELL® Multi Disinfectant spray is LIFE! Anyway, before I go crazy telling you how amazing this is, and I promise I will. 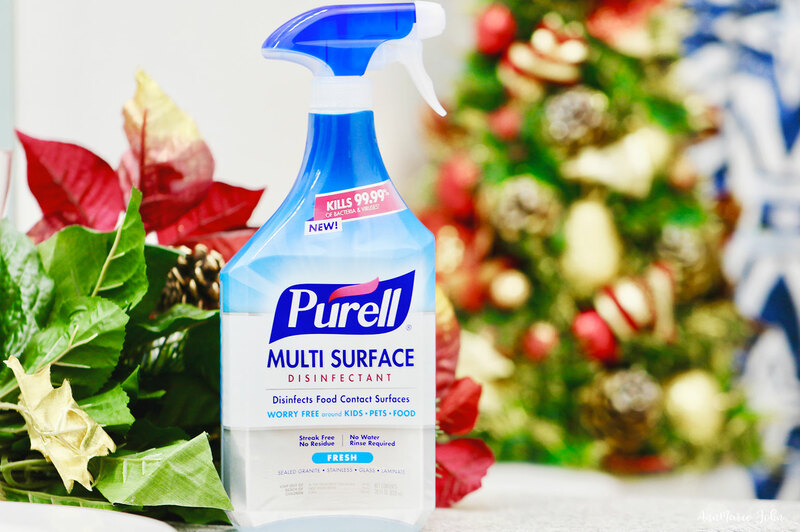 Let me share with you three easy ways you can keep germs at bay this holiday, and trust me, you're going to need PURELL® Multi Surface Disinfectant. This has always been my number one tip. Little children not only love to touch everything, but they also enjoy putting said things into their mouths. Bacteria and viruses can live for a day or more on objects and every day items that we touch, such as doorknobs. While using hand sanitizer can be an effective way of killing said germs, especially when water is not available, washing with soap and water thoroughly is even better. Teach your children the proper hand washing method, of washing for at least 20 seconds with preferably warm water and soap, and remind them to wash their hands especially after using the bathroom. There's a right way to cough and sneeze, and that's by using the crook of your elbow, unless you have a tissue on hand. Teach your children how place their nose and mouth in the crook of their elbow in order to prevent the spread of germs. If you child does sneeze or cough in their hands, having hand sanitizer on hand will help to kill the spread of germs as well, or once again wash those hands! Since germs are usually spread through touch, having clean hands is a bonus. The flu virus can survive for as little as a few minutes, and as long as 24hrs on certain surfaces. Using a disinfectant such as PURELL® Multi Surface Disinfectant is a sure fire way to kill the cold and flu virus. It quickly kills 99.99% of germs including cold and flu, strep and salmonella with absolutely no harsh chemicals, and is worry-free around kids, pets and even food. You can use it on your food-prep surfaces, and you don't even need to rinse your food prep area when you're done, so there's no need to worry. Use it on your kids toys, and don't forget those doorknobs, including your front door, bathrooms and bedroom doors. Here's another fun fact, you can use this in places you've never thought to use a traditional cleaner before, and it won't stain your clothing either! I told you this was life! In my daughters' school, children can only return to school after they have been fever free for more than 24hrs. Keeping sick children at home until they are no longer contagious will not only help to prevent the spread of germs and illness to other children, but will prevent your own child getting reinfected. Oh how I wish all parents did this. 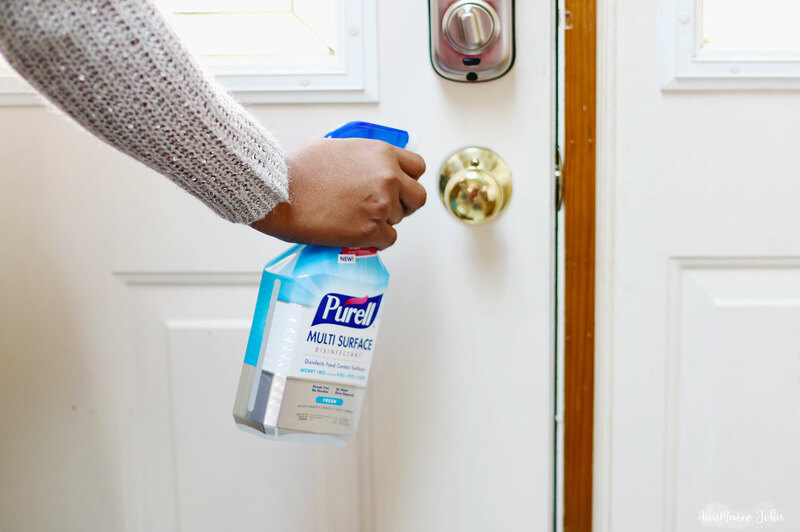 If you keep PURELL® Multi Surface Disinfectant on hand, and use my tips, you will most certainly keep those germs at bay and in turn keep your family healthy. You too can purchase PURELL® Multi Surface Disinfectant online at Amazon.com (where you can get 20% off your purchase), Jet.com and Walmart.com as well as in store at H-E-B and Publix, and it will soon be available in stores at your local Shop Rite and Wakefern Food Corporation. I always use Purell products whenever I am traveling. I had no idea they have an disenfectant too. Thanks for reviewing this. I have to try them out! We just started using This PURELL Disinfecting Spray and will sharing all about it, too. So couldn’t agree with you more about this, as well as your tips here, too! This is so important to keep at bay around the holidays when friends and family gather. Lots of little ones carry the most germs. Good points here!! I need to get this cleaner. I use Purell hand sanitizer all the time, and this is perfect to add to my anti-germ arsenal. I haven't come across Purell disinfectant in a spray bottle. Going to get this as soon as I see one! I do carry a purell hand sanitizer in my hand bag and use it a lot. It gives me a piece of mind. I had no idea this existed. I'm buying it as soon as I see it. Ugh, I am so dreading cold and flu season. We have Purell in each room to try and keep the germs at bay this winter! We swear by Purell in this house, although I have not heard of this until just now. I will definitely be grabbing some. Part of my son, 34, illness is fearing getting sick and with the grandchildren coming and going he is constantly fretting. Now he can get some relief. I hadn't seen this product before. I like that it's safe for use around kids, pets and food and doesn't have a bad smell. I've just recently heard about Purell's multi-surface disinfectant. Will have to look for it the next time I'm out. We love the PURELL Multi surface cleaner! It has been a life saver in our home during this time of year! I didn't know Purell had a spray, I always carry the hand stuff in my purse. Will add the spray to my shopping list. These are very good reminders on how we can keep the house germ-free! It's really important that we make sure that everything is cleaned and disinfected especially when someone in the house is sick. Awesome tips! 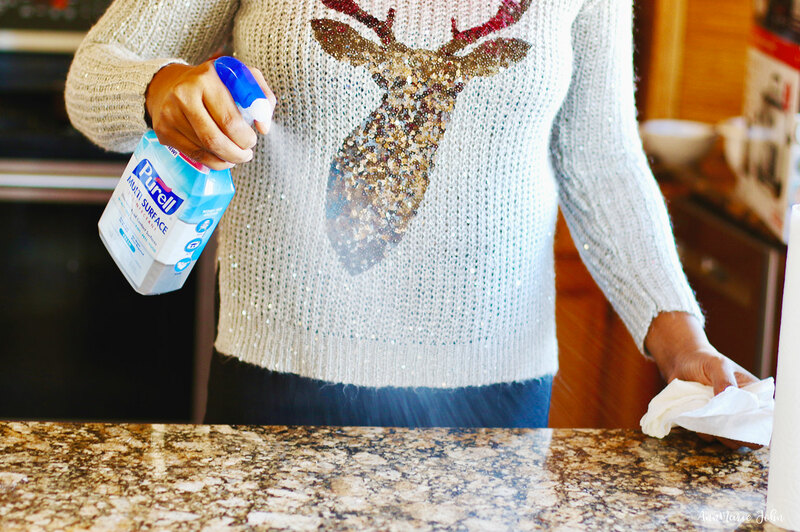 These are great tips for staying germ free this holiday season! Also, I love that sweater. Great tips. I have to tell my kids about that crook of the elbow thing. I mean, sometimes a sneeze comes suddenly you won't have time to pull a tissue out of your pocket or purse. I will also get some of that Purell disinfectant sprays. Better to be safe and keep those germs at bay! We have used the Purell hand sanitizer for years. I had no idea they had a spray. I am so excited! I think I need it for my classroom!! Keeping germs at bay is definitely on my list today. I'm sick and HAVE to teach tomorrow, which stinxxx. I'm going to find and buy this Purell spray. Great tips! I need to get some of this disinfectant! We have a two month old, and I have been doing everything I can to keep the germs away. I am really excited to learn about Purell Disinfectant Spray. I am on biologics that strip me of my immune system so I can never have enough sanitation around the house to help prevent me getting sick. I usually buy wipes, but they dry out so fast. I love that this spray is available so I know I am properly covering all areas of the home. I love going to place that have Purell on the tables. Makes me feel like I am in a clean environment. I have been disinfecting everything. Somehow, little germs found their way through. I have to get those disinfectant sprays. I have been sick lately and it is not pleasant. The cold weather really has a way to spread germs, but enough of it. Purell is going to help me keep those germs and viruses at bay. I love Purell! Such a great way to keep your house healthy for the flu season! I have never used this disinfectant spray before! Time for us to give it a try!! It seems affective! I've used a different brand when it comes to surface cleaning, but this sounds like a great product! I would love to check it out. I do really love to use this Purell disinfectant spray. This is such an awesome way to keep our house clean and fresh. I love Purrell! I had no idea they came out with a spray. That is so cool! Whaaat, I Didn't know Purell made a disinfectant spray?!!! Thank you for sharing this- I use their hand sanitizer all the time and LOVE it. It's my go-to item always kept in my purse. I'll have to try out the spray now! Cheers to keeping sick kids at home! We have this exact product at home. I could NOT do the holiday season without it.